I woke up with a heavy head…Wait! I wasn’t supposed to be alive…I recollected the thick blanket of smoke that day in 2015. Just one whiff and I knew it was just what I had feared- Biochemical Warfare… Noxious fumes to ‘settle scores’. I wondered- Is this my after-life? I looked around trying to gauge if I had been allotted a place in Heaven or Hell! It looked like I was in a very sophisticated futuristic world with hi-tech gadgets all around. “Year 2215”- the e-Calendar displayed. “How have I travelled 200 years into the Future?” asked my Brain. “Because You Are Explorer” answered the human or was it a machine? “Change in Climate 30 times faster than at any time in Earth’s 65 million years. Global Temperature Rise of 15 Degrees Celsius. Sea-Water Level has risen by 3 metres. Ozone Layer is 93.5% Depleted. ME: “This sounds like major Dooms-Day. In our time, a rise of 2 degrees Celsius increased civil wars by over 50%. That explains the conflict linked to Climate Change in 2015 when I died with most of the World’s population. Shifts in Climate are strongly linked to human violence around the world. “I revived your soul and body through my Brain-Waves. You are a Top Explorer of 21st Century. You have explored the Whole World with your Tata Safari Storme. You have travelled around the World in 8 Days. Your Blog Name- ‘The Explorer of Miracles’. I was totally amazed when I found that RerolpDotXe had also revived two of my Idols- JRD Tata & Marco Polo! (29 July 1904 – 29 November 1993) was a French-born Indian aviator and business magnate. He was India's first licensed pilot. He is known as the father of Indian civil aviation. He founded India's first commercial airline, Tata Airlines in 1932, which became Air India in 1946. 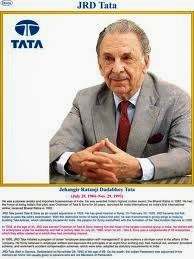 He directed the large Tata Group of companies for decades- Steel, Engineering, Power, Chemicals and Hospitality. He maintained high ethical standards - refusing to bribe politicians or use black money. In 1992, he was awarded India's highest civilian award, the Bharat Ratna. 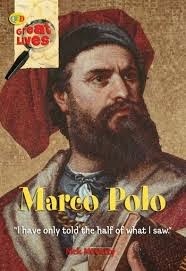 Marco Polo- (1254 – January 8–9, 1324) was an Italian merchant traveler from Venice. His travels are recorded in Livres des merveilles du monde. His journey inspired Christopher Columbus and many other explorers. He wrote about his travels. Marco Polo influenced European cartography. I, ANITAEXPLORER, was standing right in front of these two great men! I can't express how honored and proud I felt! The three of us had been chosen to explore the Universe using the advanced technology, superfast- AIEV-Tata Safari Storme. AIEV is the Tata Safari Storme 2215 Edition! No Non-Renewable Energy sources needed to run it; it works on Renewable source- Universe’s Energy. We were expected to come up with the best solution for Planet Earth ASAP. I felt so honored to be a part of this elite company; yet felt responsible at the same time. Spiderman Movie’s line- “With great power, comes great responsibility” played in my mind. 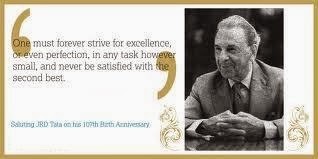 The two incredible gentlemen-JRD Tata and Marco Polo demanded that I lead our Unit. They believed in Woman-power! I felt like SuperGirl! They checked all the accessories. They made huge lists of things to carry and loaded all the essentials in our AIEV. We put on our Explorer gear. We boarded our AIEV and made ourselves comfortable in the Leather-Seats. We safely strapped the seat-beats. There was auto-firing and destruction of unnecessary objects on our path and auto-avoidance of collision with planets and other important bodies… Phew! I remembered all the sci-fi movies I had watched and the video-games I had played. All this was happening in real-life! There was a world-class infotainment system that had us entertained. I listened to my favourite Asha Bhosle, Lata Mangeshkar & Kishore Kumar Songs. JRD Tata and Marco Polo also enjoyed them! The superb navigation system gave us info about what to expect. I had already fed the data of what we need. AIEV was taking us to those places that had our requirements. The first stopover was a Planet that we named Waterland, as there was ‘Water Water Everywhere’ in all different forms. Marco Polo navigated our AIEV here while JRD Tata communicated with the 10-Headed Hydra Beasts inhabiting the Planet. I remembered Ravan and fantasized that they might be his descendants! Would you believe me if I shared that the Beasts actually agreed! It seems their ancestors, some sons of Ravan, had fleed in the Pushpak Viman to Waterland! We collected ‘Fresh Water’ from there. It was no ordinary water. Putting the same sample in our Oceans on Planet Earth would restore them to their previous glory- purity as well as Polar Ice-Caps! Got to use our AIEV's ample lights and lamps while travelling! Next we landed on Ozonia Planet. There was such an abundance of Ozone there. Our AIEV made us wear the gas-masks that automatically dropped down as the level of Oxygen had fallen very low. When I wondered how the Queen of Ozonia looked so fresh, she Brain-Waved me- that she always had Ozone-Facial done multiple times a day!!! But, their Carbon-Monoxide, Carbon-Dioxide, Sulphur-Dioxide, Methane, Nitrogen Dioxide etc. levels had fallen much to their disappointment. Luckily, JRD Tata had filled cylinders with compressed poisonous gases of the world! I now understood why he had been so particular to load those cylinders in our AIEV! I promptly handed them over & released the excess poisonous gases in Ozonia. We refilled Ozone in all those cylinders and loaded on our AIEV. This much would be enough to 100% repair Planet Earth’s Ozone-Layer! Then as we were travelling, suddenly, our AIEV experienced strong magnetic waves and got attracted to another Asteroid that was NOT in our agenda. Door Visor protected us from the harmful radiation. Why had our AIEV been ‘pulled’? As AIEV landed, we found the planet had muck and slush and was trapping our AIEV… Marco Polo immediately activated our AIEV’s navigation. The Nudge-Guard was helpful. Then, we saw a mammoth creature that was lying in deep pain. It had been badly hit and needed immediate attendance. That’s why it had captured our AIEV with its powers as it sensed friendly souls. I opened the expandable Cargo Basket and elongated it to fit the creature, who guided our AIEV to the Space-Hospital. All of us felt nice with our Good Samaritan act. We discovered the treasures of the Universe with our AIEV. We realized the potential of the energy waiting to be explored. Apart from all the above 'gifts', for Planet Earth, we also got greenery, fresh Oxygen, smiles and a lot many things that made RerolpDotXe proud of us. When we returned, a grand reception awaited us- the Explorers! 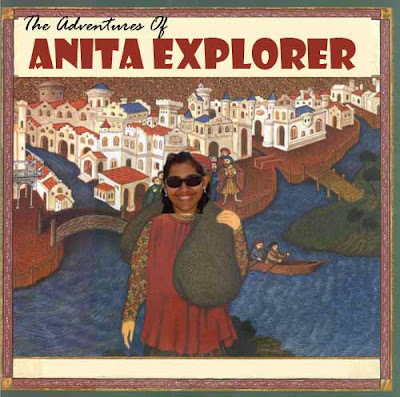 The Explorer Project was successful! 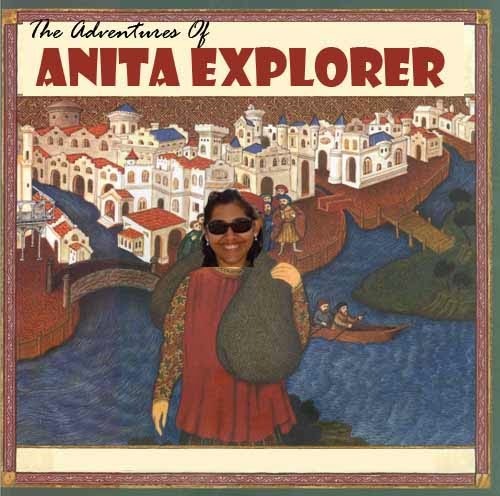 In this way, I, ANITAEXPLORER, along with my two great Explorer team-mates solved Planet Earth’s problems with excellence! My ‘Subject’, the 80-years old man with silver-hair, sipped the bright Orange-coloured liquid I handed over to him in a test-tube. But, Homo-Sapiens are a class of their own. Only God knows what the effect would be on God’s most intelligent-beings on the planet! “Never play with Nature!” my Professor, a reputed Scientist, had always warned us. My ‘Subject’ wanted to go home. I allowed him as I myself didn’t know how long the effect of my drink would take- 24 hours, 72 hours, a week or a month? No clue…! I heard urgent knocks and impatient doorbells… I rushed to open the door. Standing outside was my ‘Subject’ with an exact replica of himself! My concoction had worked and did have the desired effect, but still I was shocked…It was more than what I had set out for. How did my Subject’s ‘cloning’ happen? I soon got my answer. The ‘clone’ turned out to be my Subject’s 40-year old son, who had got my details from his Dad's Diary. “Dr.Anita, What have you done to my Dad?” he demanded angrily. 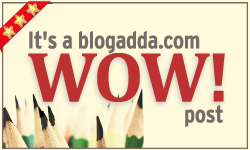 Proud that this Post features amongst the best posts & earned this WOW Badge from BlogAdda HERE. 'Battery Critically Low’ flashes my Phone! I get my daily dose of exercise done! I keep in great shape anyway! No Gym membership needed! Save Time & Fees! Just run to locate the Phone’s Charger please! I become a ‘Ninja’ or ‘Supergirl’! I function in high-speed like a whirl! Lightning fast! Just 30 seconds more! I don’t want ‘Power-Off’ in store! Just thinking- ‘Phone will shut down’! Replaces my Million$ Smile with a Frown! But, I have full faith on my reflexes & memory! I reach where my Phone’s charger is there! Stop myself from getting a scare! Quickly charge it before its battery can ‘die’! Breathe a sigh of relief! Oh My! A terrifying sense of helplessness grips me! But, depleting even that happens easily! For auto-recharge, how long do I wait? Oh Phone-Developers, please understand my state! Smart enough to RECHARGE SMARTLY! I saw the hashtag #MyPhoneTaughtMe trending in Twitter in the first week of September. I decided to share what I have learnt from my Phone. Actually, there are a lot many lessons as learning comes very easily to me! Still, I shared what’s of prime importance. Actually, the exact tweet I posted is now lost in my Twitter- TimeLine. But, the same tweet had earned quite a number of retweets! My kid was pleased! “I’ll take this new water-bottle to School!” she said with glee! I am a HUGE CONTEST JUNKIE! This is in total contrast with my Techie-Hubby who is happy with his laptop, phone and office and would have nothing to do with any contests. He feels I am wasting my time and talents! But, still I dream to win contests! Luckily, despite his disapproval, thankfully, he patiently supports me in my quest to win contests! Accompanying me to all the Car-test-drives as I hoped we would be the lucky-winner of the Car...!!! However, after all these years of trying, my BIG WINS are few and far between! From the last two years, my Hubby has been planning to gift an iPad, iPhone & Car, just for me! Any normal wife would have jumped at the prospect & would have liked to be 'gifted'! But, I am made of CONTEST JUNKIE material! I told him, "Please don't buy! I'll WIN!" I have been planning to win all these for which I have been trying like crazy for years! Yes, I have enough money in my bank-account that I have earned and can easily afford to buy all these and more today! But, winning gives me a HIGH! I love to take part in contests and attempt to win! Hubby must have been convinced of my strong intention to win! Small wonder, he started forwarding me mails from his Bank that promised 'WIN iPAD' by spending 'X' amount on Credit/Debit Card! I told him, "Do you realize you are actually asking your wife to shop and spend more?!!!" He appeared more than happy, and continued with his recommendations! "What is the line that appears on-screen at the end of our TVC? 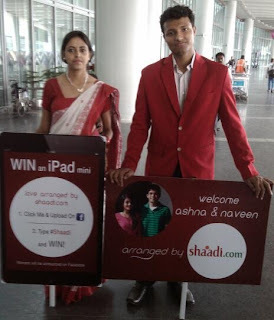 Click a pic of the Answer outside #Kolkata Dom Airport & WIN an iPad Mini." I thought, "This must be the iPad that's for ME!" 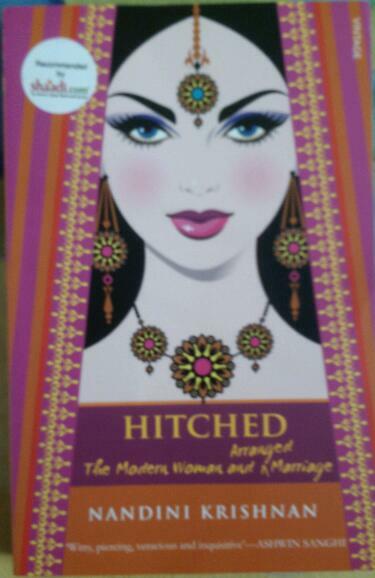 Earlier, the only prize I had won from @ShaadiDotCom was a Book- 'HITCHED' by Nandini Krishnan. I had won it by sending lots of winning tweets for the #ShaadiSurvey Contest! Now was the time to try to win the #Shaadi iPad! I lost no time! yet I set out for the Kolkata Domestic Airport rightaway! 'No Pains, No Gains', I motivated myself! I reached the Airport and started looking everywhere, just like a Jeweler would look for her lost Diamond! Here, nothing was lost; rather had to be found! I had to spot the #Shaadi sign-board, click a pic and then tweet it. But, where would I find the sign-board? I thought of taking help from the Security-Guard. "Have you see the ShaadiDotCom Sign-board?" I longed to ask! But, I didn't! 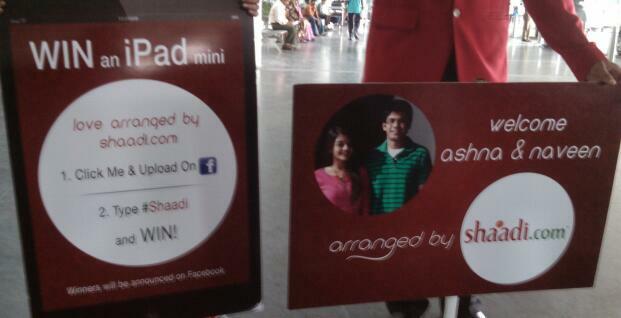 The sunny afternoon appeared cool the moment I set my eyes upon the ShaadiDotCom Team! Super-happy to spot the Jodi at Kolkata! The effort felt worth it! 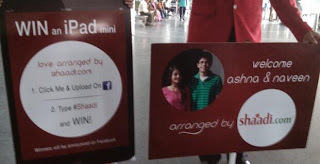 "'Love arranged by shaadi.com.' Loved the concept! Happy to spot the Jodi!" I called up my Hubby, who was out of town, and requested him to do the needful. He, in turn, sent me his Facebook account credentials. As he was busy (as usual! ), he asked me to register myself! On 13th September, my efforts really bore fruit! I was THRILLED to be declared as of the WINNERS of of the iPad Mini! YAAAY! 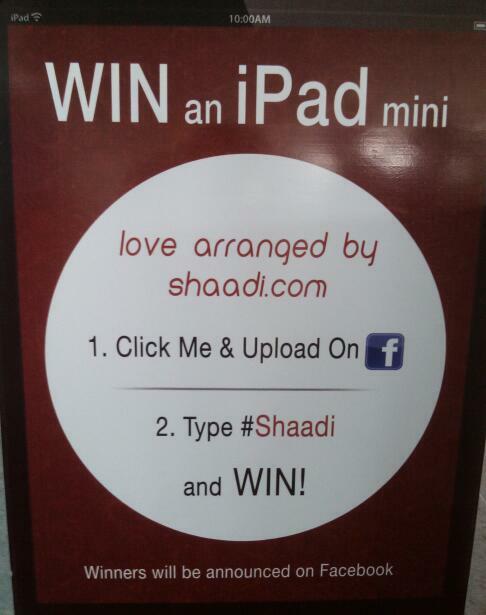 A BIG WIN thanks to @ShaadiDotCom ! I called up my Hubby and informed him the great news. He didn't have to buy an iPad for me! Hubby: "What kind of message/picture have you posted on FB? I'm getting all sorts of queries. Me: "That Picture was of the Couple who were holding Shaadi.Com Sign-Boards. Had to spot them with the Sign-Boards at the Airport & upload pics on Twitter & FB to WIN iPad! I had briefed you earlier, remember?" Hubby: "About this Shaadi.Com, people are asking if everything is okay on personal front and if I'm open to proposals. I can buy an iPad, but can't afford controversy. You have got to be careful." You getting Shaadi Proposals till now?" Hubby: "So far it is male colleagues who are concerned. But, you see it is public news now." Me: "So strange! Would you like me to post an 'ALL IS WELL' status-message from your FB-account for all the blind people who can't read the sign-boards & the messages?" So I again logged on to Hubby's account and posted the following Disclaimer! Now I plan to post a link of this Blog-Post as my Hubby's new FB Status-message! Wait! That's possible if he hasn't changed his FB Password as yet! Blogging lets me Celebrate Blogging ! 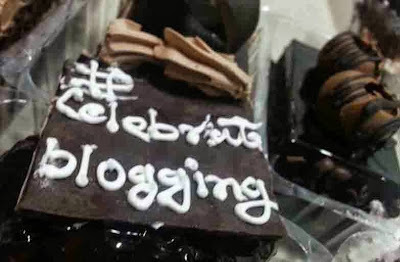 Pic1- Blogging lets me Celebrate Blogging! 1-2-3-4, I wanna BLOG more! Share & Reach out & Explore! To learn, unlearn & grow and celebrate everyday. To open the door when Opportunity knocks! To smell the roses & if needed, even the socks! Education- To complete my PhD and add ‘Dr.’ to my name. To achieve- Complete my field-study, data-analysis & submit my Thesis. To achieve- Aviva Young Scholar Secure – Lumpsum payouts for high school, graduation & post-graduation expenses. To achieve- Work Hard, Earn & Save money & update my wish-list! List what I want in life & to achieve get all set! Get what I like lest I should be forced to like what I get! I'll sincerely take care of all the above small plans! Then, my BIG PLAN - LIFE will take care of itself- 100% Chance! Thanks Aviva India! I shared my plans in life and how I plan to achieve them through the ‘Aviva- What’s your big plan’. Sachin Tendulkar, Hope to meet you soon! Image Courtesy- Google Images & Aviva India.